Jolie Pethtel is author of Painted Jezebel the first book in her new series, A Jezebel Jinx Mystery. Holly: Hello Jolie! Can you tell us a little bit about yourself? Jolie Pethtel: I’m a married mother of six. I love writing, reading and photography. Jolie Pethtel: I’m one of those lucky people who has always known what I wanted to do with my life. I wasn’t inspired by any particular author, I just knew this was what I was meant to do. I wrote my first story in second grade. I started out with a toy typewriter, a manual, then electric, a word processor, a desktop computer and finally my laptop which I use now. Wow, that makes me sound old, but it shows the stages of my development as a writer from the time I was a child. Holly: Can you tell us a little bit about Painted Jezebel? Jolie Pethtel: Painted Jezebel is a bit of a cross genre book. It’s a romantic comedy and light mystery. 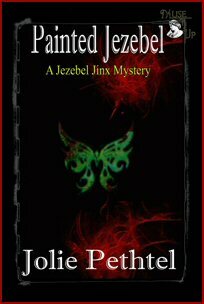 Holly: What was your inspiration for A Jezebel Jinx Mystery series as a whole? Jolie Pethtel: It wasn’t supposed to be a series. There was just the one book, but my editor loved the book and the characters so much she asked me to write more. Holly: Why did you choose to write Mystery/Thriller/ Contemporary fiction? 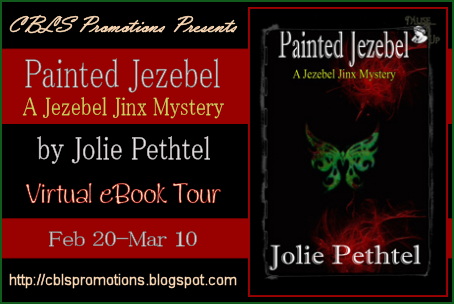 Jolie Pethtel: Painted Jezebel isn’t a thriller. It’s not a dark book at all, despite the murder. Imagine clue with a romantic element or monk and you’ll be closer to the mark. The Jezebel stories aren’t what I normally write, but the character was so vivid in my mind I was compelled to write her story and she still has more to say. Holly: Can you tell us what do you have planned so far for 2012? Jolie Pethtel: Poison Pens will be the next installment in the Jezebel series. It has less romance and more mystery, while staying true to the first book. The series is evolving. It will still have it’s funny moments and continuing characters, but I’ll be delving into their secrets with a truth or die theme at a murder mystery weekend that goes bad. The second book will be much more involved than the first with a lot of surprises. Jolie Pethtel: My main character Jezebel is a suspense writer and I think that has caused some confusion about the genre of the book. If you are looking for a dark thriller, this isn’t the book for you. If you want to have a lot of laughs and try to solve a mystery with some interesting twists, I really think you’ll love this story. Both the main characters and Jezebel’s friends are really likeable each in their own strange way. I think as you get to know them, you’ll find yourself wanting to know more, particular their secrets which will be revealed in book two. Beyond that I’d like to say thank you for stopping by and I hope you enjoyed the interview. Holly: Thank you so much for taking the time for this interview, Jolie! Jolie Pethtel: Thank you for having me as a guest on your blog. I really enjoyed myself. "Publicist Finn Mackenzie has always been lucky, until an ill-fated affair with a vindictive writer leaves him one chance for redemption: a spectacular public appearance by the elusive best-selling romance author, Jezebel Jinx. Unfortunately, the cute but kooky writer refuses to cooperate. Jezebel believes she’s cursed with bad luck. Riddled with anxieties, she never leaves her home--until the gorgeous, albeit desperate Finn whisks her away to a writer’s conference, against her will. When his ex turns up murdered and Jezebel is the prime suspect, ill-planned sexcapades are the least of their worries." Jezebel’s stomach lurched abruptly, jarring her back to consciousness. Flashes of bright, white light burst behind her tightly closed eyelids and she knew this was going to be one killer hangover. Her memory was a bit hazy—a complete blank really. She didn’t recall getting drunk and blacking out, but she must have. Happy Birthday to me. The day was a complete bust, of course. She’d have to write twice as much tomorrow to meet her deadline. All she wanted right now was some aspirin for her pounding headache and a good night’s rest. Maybe tomorrow her mind wouldn’t be so fuzzy. Jezebel gingerly opened one bleary eye and then the other, trying in vain to focus on something—anything. She only succeeded in making herself dizzy and nauseous. The scenery passed by in a blur, with only one consistent focal point—a continuous row of palm trees and while Arizona was thick with palms, there weren’t any in her neck of the woods. The implications were sobering. Dear God, this had to be a nightmare. Even in her present groggy state, she could tell she was no longer safe and secure in her cabin. Worse yet, she deduced she was in a moving vehicle, being transported to God only knows where, and with each second that passed Jezebel sped further and further from the only safe haven she had ever known. She would never have consented to such a thing of her own free will and with this realization confusion fled and panic set in. She was being kidnapped! Jezebel wanted to scream and yell for help, but knew instinctively that if she did, her head would likely explode. The pain was excruciating. She touched carefully around her skull with the tips of her fingers. She suspected a blow to the head had caused her current unfortunate circumstance, but no evidence supported that notion. “Hello, sleepyhead,” the kidnapper greeted her in a cheerful tone. She knew that voice. The familiar Irish lilt. It was that attractive, if annoying, publicist. She knew he was desperate to attend some conference, but kidnapping? The man was a lunatic. She’d witnessed his desperation first hand, of course, but never imagined he would dare go this far. How had he managed to lure her out of her cabin and into his vehicle without a single protest? Jezebel fought to remember. She should have screamed the house down. What he accomplished was an impossible feat, but he was more devious than she had given him credit for. There was only one way he could have pulled this off. “What did you do to me?” Jezebel rolled her head to the side with considerable effort to give him her most fearsome glare. He didn’t even flinch. “I just gave you some sleeping pills.” He shrugged. “You could have killed me!” Jezebel was horrified. “Don’t worry. I came prepared for this.” Finn pulled over to the side of the highway and handed her a paper bag. “What—the Hell—is this?” she wheezed, studying the bag as if it were a foreign object. Find the tour schdule here. Jolie - love your work...and highly recommend it for anyone looking to read a mystery romance with great story-stars...love their banter and their comedy relief...made me laugh out loud.